When it comes to document management in South Africa, DocX is certainly ahead of the curve, which is why we are excited to let you know about one of Xerox’s new printing machines – the Xerox Impika eVolution printer. This printer is so named because of its awesome revolutionary capabilities. This full colour continuous feed production inkjet printer can print on coated and uncoated papers with print resolution quality of 360 x 600 dpi, 600 x 600 dpi, or 1200 x 600 dpi. This means that, whether it’s silk paper or matte, you have superb quality with every sheet you print. Furthermore, it can print using a variety of inks, such as those that are water-based, dye or pigment, and even specialised ink on demand. This powerful machine can print up to an incredible 3 628 pages per minute, which equates to a maximum of 254 meters per minute! And perhaps the best part of it is that it is scalable, as speed technology is variable with two and four print head options. But no matter how you use it, it consistently produces quality, vibrant prints. Over and above all of these awesome features of the Impika eVolution, it is also upgradable, with up to six colours and up to five drop volumes. 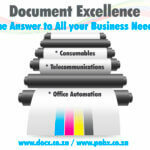 This device simply serves to show just how advanced Xerox technology is when it comes to document management in South Africa and indeed, the rest of the world.